This is basically the ASUS WL520GU based Webradio as Jeff Keyzer presents it on his webpage Mightyohm.com, only that I adapted the display related shell scripts to suit my LCD Display driver. This is a great project and I would like to say thanks to Jeff for his great step by step instructions! 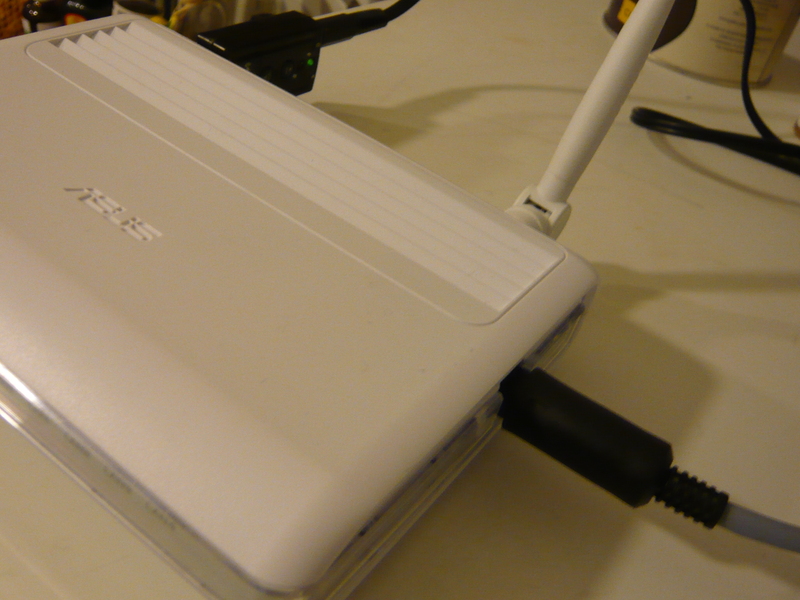 As a connector for the serial port, I used a mini DIN connector and socket which fits quite nicely to the side of the router. 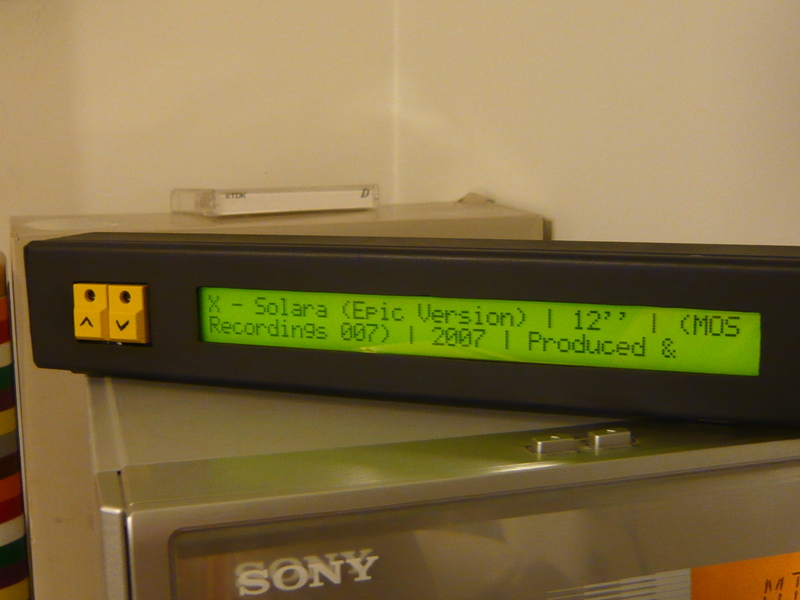 This is how the display looks like, as a housing I used some cable conduit where my display + electronics happened to fit right into. I just gave it a slash of black color, that was it. Buttons are some leftovers from another project I did, they will be replaced by black ones as soon as I find new cover lids. As I wanted to keep the LCD display driver as general as possible, I opted to do all the text parsing and line wrapping related stuff straight in the linux box, therefore I changed the shell scripts responsible for the display output. Wrote a new Interface script which allows to display a menu of all preset radiostations. By sending ‘MENU_’ over RS232 to the router, the display will now show the current station, any ‘BUTTON_’ command will cycle through the preset radiostations. One more ‘MENU_’ command will select the current station and start playing it. This way, the station selection is performed in a much nicer way than previously with the Up/Down commands. The new script can be found in the project zip file and is named ‘interface3.sh’. # in the format "BUTTON_" and "MENU_", one line at a time. # This script also launches display7.sh, the LCD display script. # "BUTTON_" commends will scroll through the list of preset Stations. # Station can be selected by sending "MENU_" once more. # Creative Commons Attribution-Share Alike 3.0 United States License. echo "Current Station: Station_$value $(eval echo \$Station_$value)"
echo "Selected Station: Station_$value $(eval echo \$Station_$value)"
echo "Menu Exit Called, Restart Display process and MPC with new station"
echo "New station selected: $value"
# Thanks to Jeff for this cool project! echo "Space Char found at index: $j"
echo "Line Char Count: $j"
echo "less than 40 chars in line"
# remove the word "Title:"